John Dykstra ’13 – Detchon Hall resonated with enthusiasm Thursday night embracing a wide variety of cultures. The International Students Association (ISA) hosted the Mid-Autumn Moon Festival. The event had a tremendous turnout despite being moved from the Mall to Detchon due to rain. ISA President Huy Ahn Le ’13 said it reflects the growth of Wabash’s Asian studies program. The ISA had to cook food beforehand due to the rain. The initial plans were to have a cookout. David Clapp, Director of Off-Campus Studies & International Students at Wabash, was pleased with the students’ effort in moving to Detchon. The ISA used the Mid-Autumn Moon Festival not only to celebrate Chinese culture, but a wide variety of Asian cultures. Associate Dean of Students Will Oprisko thought the festival was a great communally unifying event. Last week, members of the ISA were invited and attended DePauw’s celebration of the Mid-Autumn Moon Festival. So, Wabash’s ISA invited DePauw to attend last night’s celebration. DePauw sent buses of students over. Loutfi Jirari, Director of International Services at DePauw, thought the two events will lead to more future collaborations between DePauw and Wabash’s ISAs. 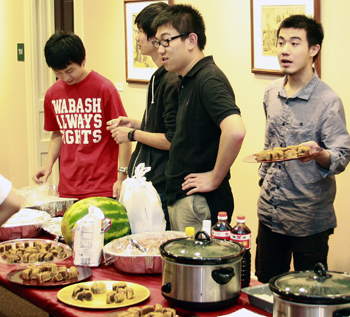 DePauw student Sally Qiu ’14 noted some differences in how Wabash’s ISA celebrated the event. Wabash students participated in a wide variety of events that entertained the crowd. Professor Ssu-Yu Chou and Qian Zu Pullen’s students sang the song “Two Tigers” together. Sam Smith ’12 was one of the students performing. Pullen was fascinated by the event’s turnout and thought it would have a profound cultural effect. Nice article. It is really a matter of learning of different cultures from this event. I like this event and also look forward to read more blogs related to this.